Dyer Symphony Harp Style 25 Model Flat Back Mandolin, made by Larson Brothers, c. 1915, made in Chicago, serial # 233, natural varnish finish, mahogany body and neck, spruce top, ebony fingerboard, gig bag case. 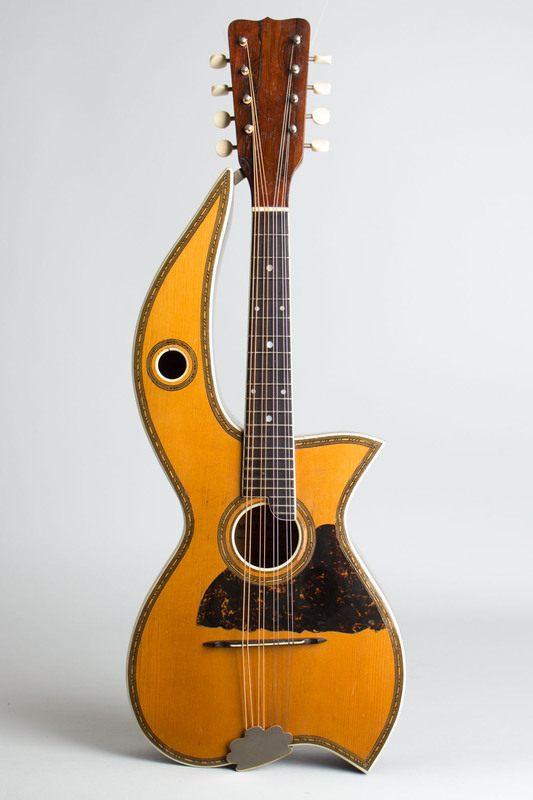 The Symphony Harp Mandolin is one of the rarer of the Larson Brothers' many fretted creations, made exclusively for W.J. Dyer & Bro in the first decades of the 20th century. The Dyer Harp guitars are much better remembered today, but a whole family of mandolin instruments were marketed alongside them. The mandolins have an upper body extension like the guitars, but do not feature any sub-bass harp strings. 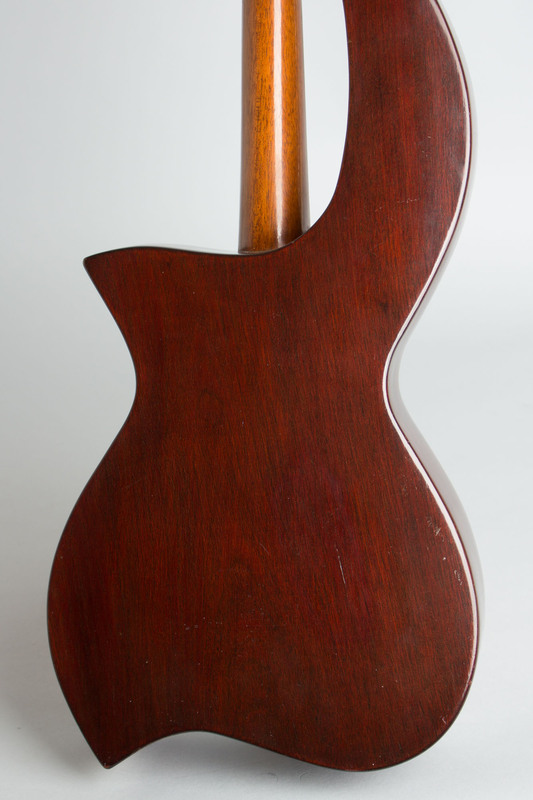 Still, the extended body with a larger air cavity definitely enhances the tonal character, giving a depth and airiness unusual in a flat-top mandolin. Actually, flat-top is a bit of a misnomer -- while not carved like the Gibsons, the Dyer mandolins are "built under tension" with a subtle bent arch to the top and back. This is a nicely original example and a very fine-sounding instrument, very different sonically from both the carved Gibsons and the typical bowl and flatback mandolins of the period. It is also quite well-preserved for its age; cosmetically, one of the nicest Dyer-labeled instruments we have had. There are only a limited number of these Symphony Harp Mandolins in existence, and they appear to be much rarer than the guitars. The Dyer mandolins were introduced in a 1908 ad in The Cadenza magazine, one of the popular fretted journals of the day. 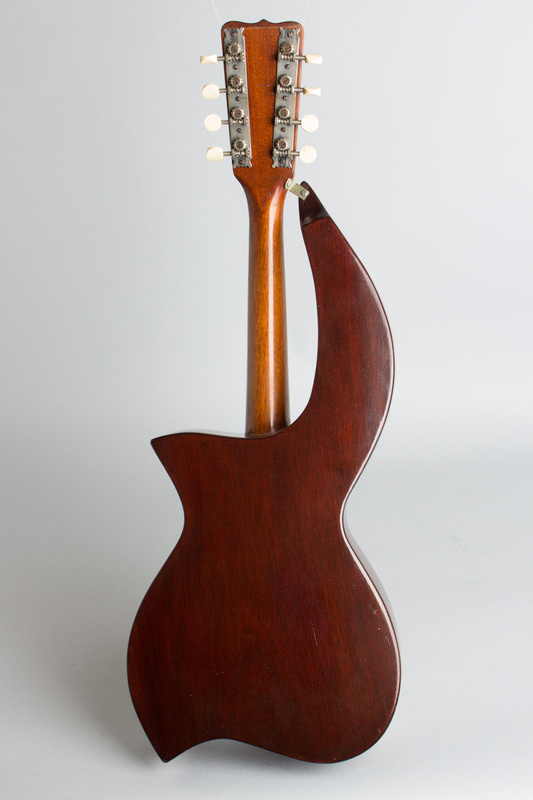 By around 1910, the design had been perfected with the body point on the side of the back edge of the body in the lower treble side -- the very first ones show a similar point on the bass side instead. 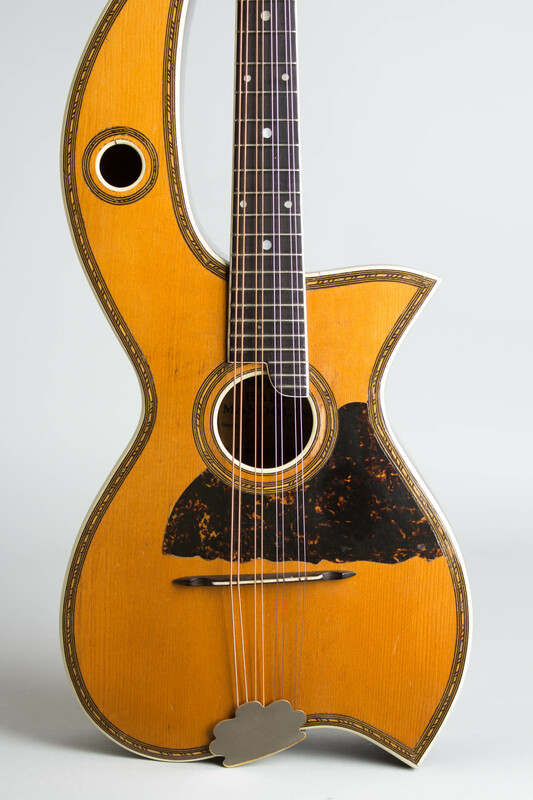 The Dyer label under the sound hole on this example reads "Symphony Harp Mandolin Style 25 number #233" with the Dyer Bros address in St. Paul below. 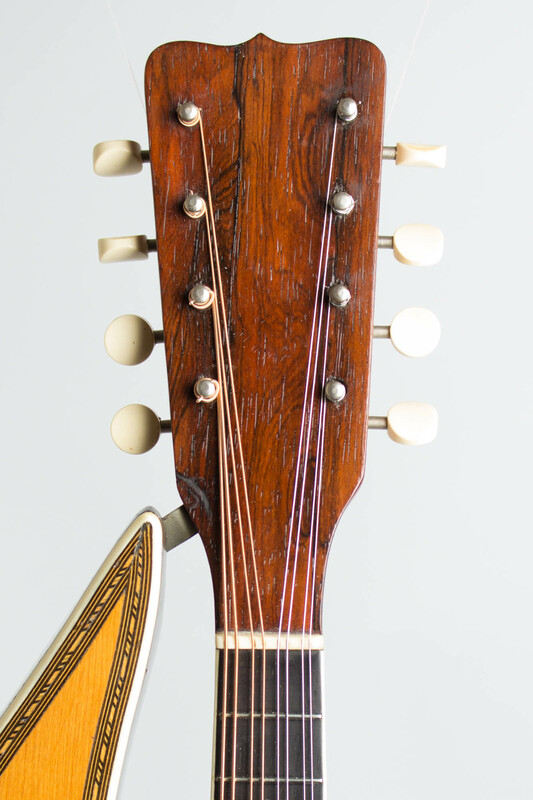 The Style 25 mandolin was a midline instrument, with bound edges and (originally brightly colored, now faded) wood purfling around the top edges and sound holes which are also bound in celluloid. While not flashy, it is a most elegant and striking instrument, with a totally unique look and feel. 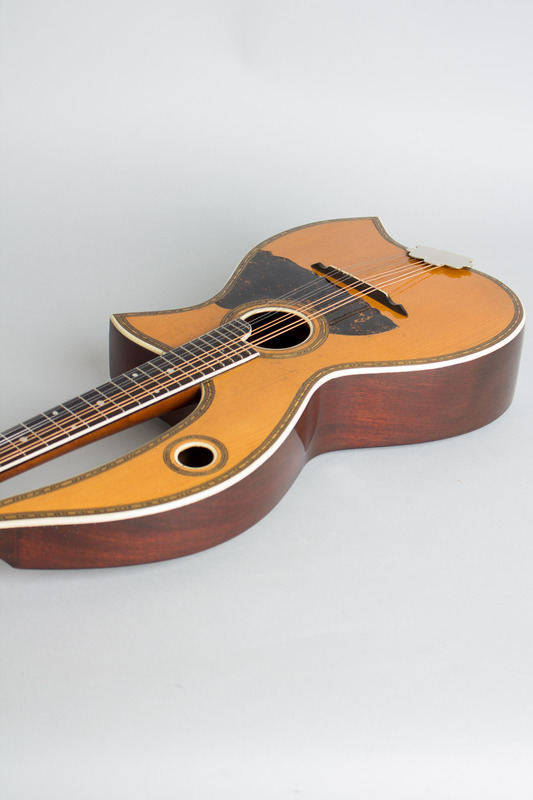 While somewhat unusual to hold and play compared to the more common Gibsons, this unique design is one of the most interesting survivors of the mandolin craze of 100 years back. Like the contemporary Gibsons, it remains a beautiful and extremely playable piece of functional Art Nouveau. Overall length is 24 1/2 in. (62.2 cm. ), 8 3/4 in. (22.2 cm.) wide at lower bout, and 3 in. (7.6 cm.) in depth at side, taken at the end block. Scale length is 13 in. (330 mm.). Width of nut is 1 1/8 in. (29 mm.). We very rarely find 100+ year old instruments in this sort of cosmetic condition, appearing played but well-cared for. This lovely Dyer Harp Mandolin looks like it is perhaps 30 or 40 years old, not over 100. It has had some damage and there is some well-executed repair work, but aesthetically it still shines both visually and sonically. There is a headstock repair, very neatly done with some clean overfinish and no extra staining or coloring applied. 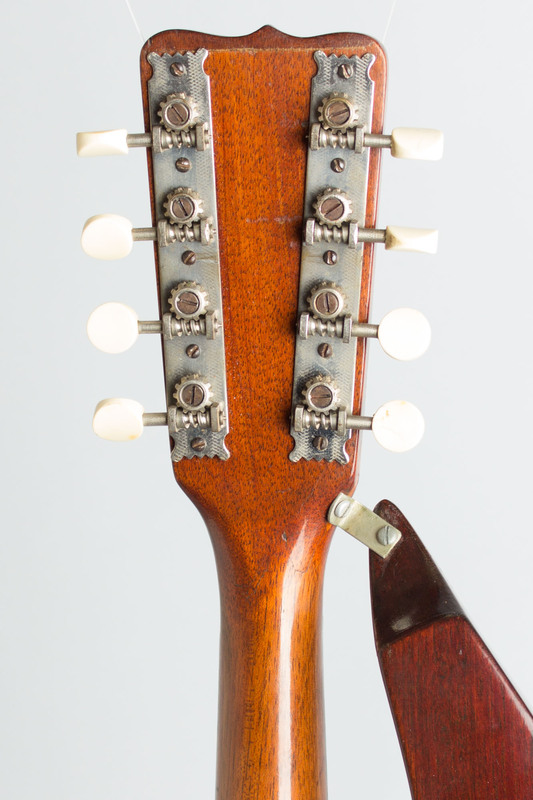 There is a fairly common "smile" crack at the base of the peghead like many old Gibsons carry, but the damage did not go all the way through the neck, and the headstock face is undisturbed. There is also a small grain crack in the center of the back with some discreet but visible touch-up. The instrument is completely solid and a lovely player. Overall it shows some light play and handling wear, mostly some shallow pick marks on the rim of the (primary) sound hole. The Larson Brothers' very thin finish still maintains a beautiful patina, and the hardware has very little corrosion. This is a very fine-sounding mandolin with a distinctive character, surviving as a tribute to August and Carl Larson who built it, W. J. Dyer & Bro. who ordered and sold it, and Chris Knutsen who conceived it. A wonderful instrument, eccentric yes but in the best ways! Excellent Condition.